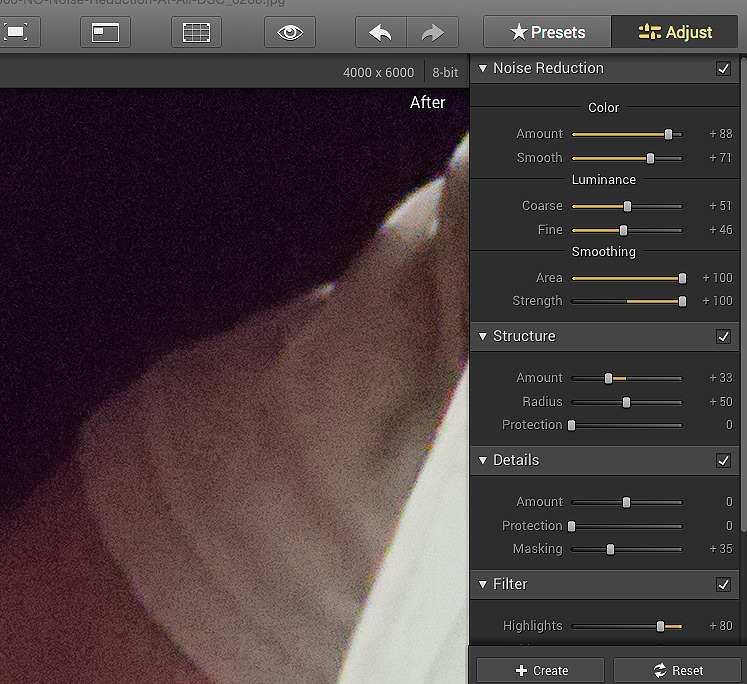 The Noiseless Pro Mac app promises to provide speedy one-click noise reduction. Does it? We find out in our test. 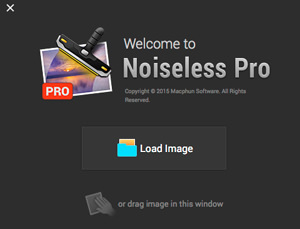 Noiseless Pro from Macphun is a Mac app which promises to make noise reduction a simple and quick process that's as easy as clicking a button. To see if the app does live up to expectations, we found a few noisy photos for Noiseless to run through its algorithms. Macphun Noiseless Pro is designed to quickly clean up digital noise often found in digital images captured in low light or with high ISOs. 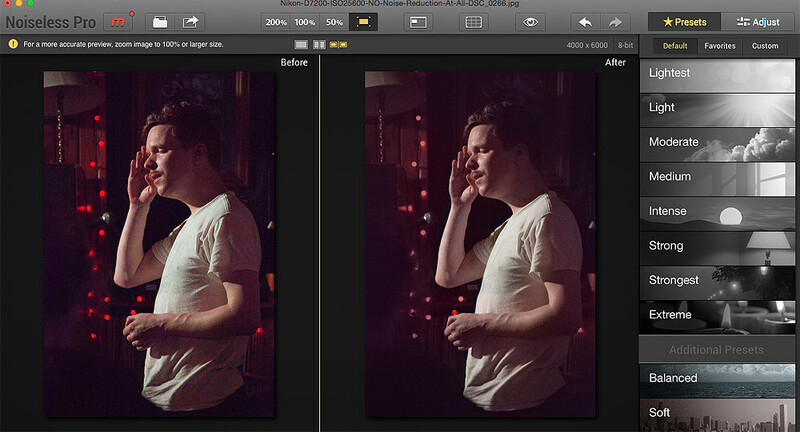 As with Macphun's Focus 2 app, Noiseless is available in two versions: Pro and Standard. The Pro version can be used as a standalone product or as a plug-in for various popular pieces of editing software. You'll also get extra presets, the option to remove noise from RAW images, Adobe RGB / Pro Photo colour space support, extra controls and a Navigation view for easy image navigation. When you open the app up, a screen greets you with an option for dragging and dropping an image from a chosen location or you can click the 'Load Photo' button. The processing of the image begins as soon as you click to open it so be prepared to wait a few minutes, if working with a large file size, for the image to open in the app. Once loaded, you are presented with 3 viewing options: fullscreen, curtain and horizontal along with 4 zoom options. 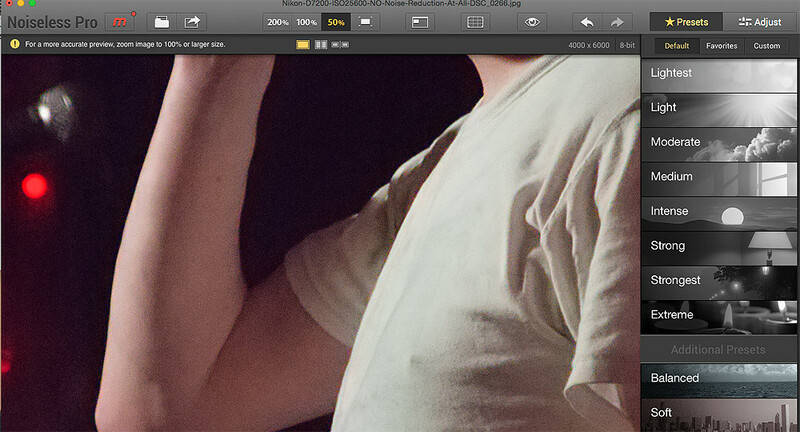 The app actually recommends zooming to 100% or more to get a more accurate preview of the shot. Other buttons along the top include a before / after preview switch, undo / redo, open and save. To the right are the noise removing presets as well as an 'adjust' option which gives you manual control over the editing sliders. 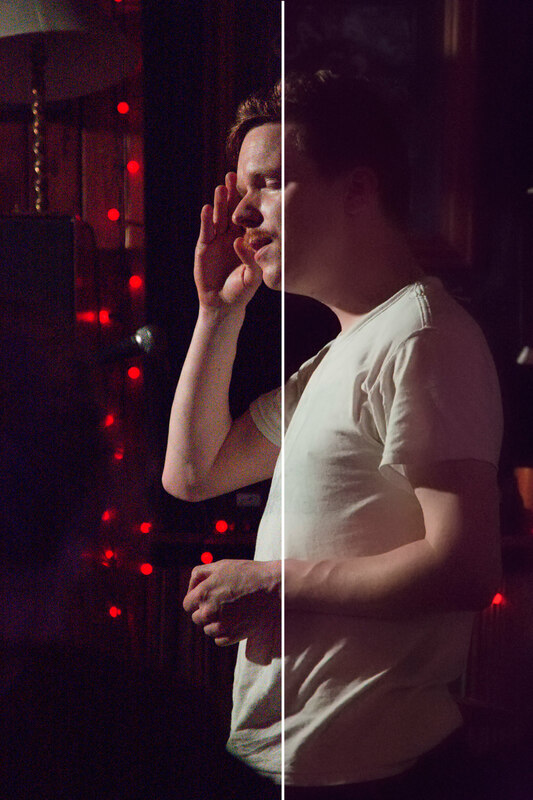 You can also reduce / increase the effects of the presets which actually do a very good job at configuring the options to suit the particular image you're editing and the preview updates very quickly when new edits are applied. 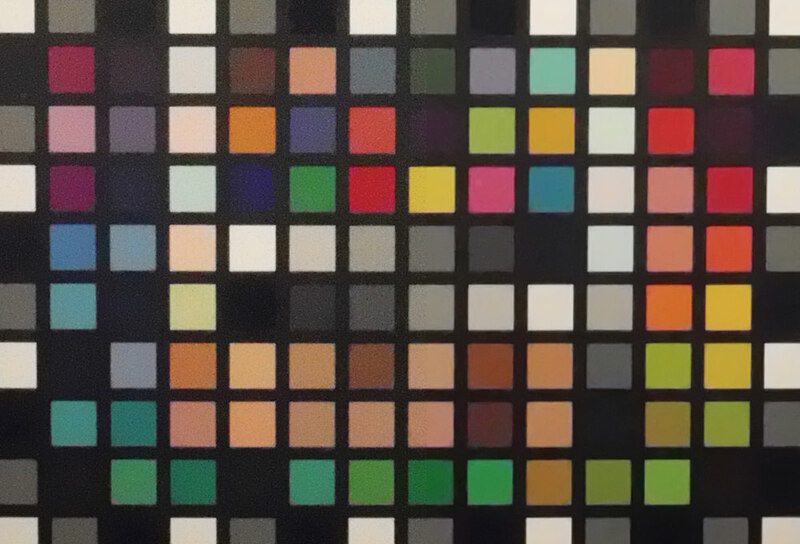 Two out of three times the app went for the 'Extreme' option when removing noise, however it felt the 'Balanced' presets (only available in the Pro version) were more suited for the job on our test chart image. 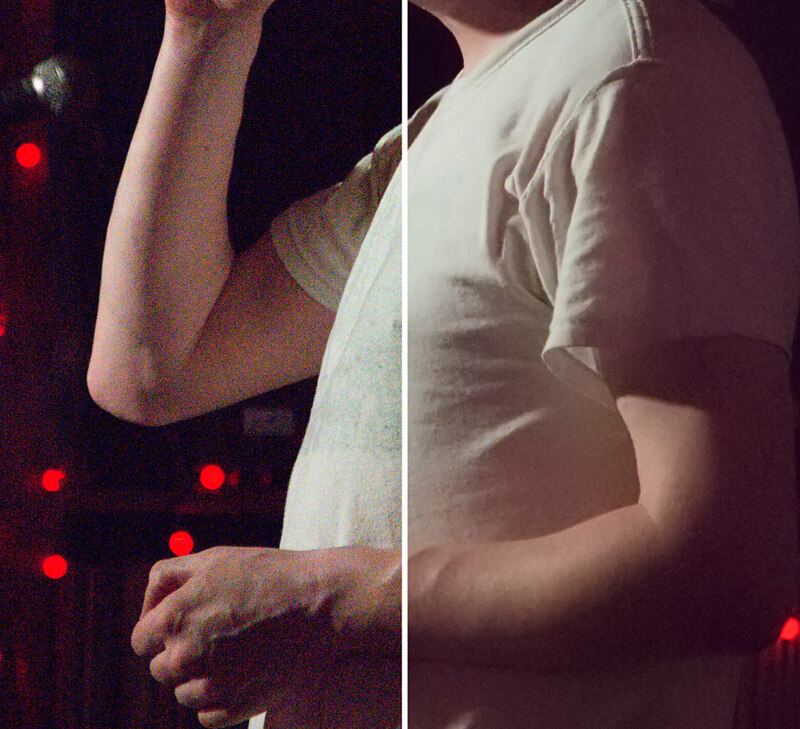 The presets at the lighter end of the spectrum are more suited to images with less noise and dark areas. If you do choose to use the tools listed under the 'Adjust' tab, the sliders are easy to adjust and thanks to how quickly the preview responds to changes, you're not waiting around to see how the adjustments change the overall look of the image. You can also create and save adjustments as presets that you can favourite so you have quick access to them next time you use the Noiseless app. The Noiseless Pro app does an impressive job at removing noise from images, however in some photos, this leads to a little loss in detail and softness appearing. This is illustrated in the landscape gif below but generally, it does a very good job at removing noise from shots and preserving detail. It also takes several minutes to save edited images once you've finished processing them but we're not talking hours of twiddling thumbs so you won't get impatient. The Standard version of the app is available for £13.99 and the Pro version for £36.99. The £23 jump to the Pro version sounds a lot but you do get RAW editing and the option to use the app as a plug-in for other software which are very useful options to have, particularly if you take lots of images and RAW is your main shooting option. Plus, as the app does most of the work for you, you'll be saving yourself time usually spent in Photoshop editing the noise out manually. This noise removing app is simple to use, changes made to the image are presented quickly and thanks to the presets, noise problems are corrected without too much effort on your part. Even though there was a little loss of detail in some photos, generally the app did a very good job at minimising a loss in quality and it really can save your noisy shots. It's smart, fast and easy to use and we are certainly happy to recommend Noiseless as a result. Macphun Noiseless Pro is a smart, fast and easy to use app that removes noise from images with ease.